On Sunday, May 12, the institutional Catholic Church holds the World Day of Prayer for Vocations – also known as “Vocations Sunday. ” As the Church prays for “laborers for the harvest,” supporters for women’s ordination to the priesthood will gather outside their churches and cathedrals to ask – Where are the women? While the hierarchy insists that women belong outside the priesthood – and therefore, outside any real leadership or decision-making roles in the Church – we will come together to say: Women are here. Women are called. Women are ready. And so we will come together on May 12, or during the Saturday vigil Mass, outside our churches and make our presence known. We will name the women whose history has gone missing: Phoebe, Lydia, Junia, Theodora, and countless others. And we will honor the women who courageously live their call today. Join the movement by planning a vigil in your area! Our efforts are in partnership with Women’s Ordination Worldwide(WOW), whose coalition members will be holding events in cities around the world. If you are organizing a witness, would like to be connected with WOC members in your community, or are interested in participating in an international event through WOW, please contact Program Associate Katie Lacz at klacz@womensordination.org. In Germany, women will be participating in a protest called Maria 2.0 from May 11-18. We can support their movement by wearing white, not stepping foot in a church that week, and praying outside our churches – just like we plan to do on Vocations Sunday. View and download our prayer service and shorter prayer. On Vocations Sunday, where are the women? Standing outside – ready, willing, and CALLED to serve as priests. 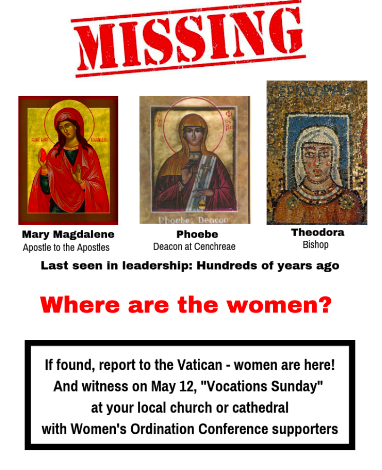 #VocationsSunday #OrdainWomen #WhereAreTheWomen Click to Tweet! “I take for granted that a woman can also be ordained…I am surprised that the presence of Christ is reduced to being a man.” – Sr. Ruth Schonenberger. #VocationsSunday #OrdainWomen #WhereAreTheWomen Click to Tweet! We are ready to break the silence, break bread, and break down the doors that keep women outside Church leadership. #VocationsSunday #OrdainWomen #WhereAretheWomen Click to Tweet! Women are priestly people – ordain them! #VocationsSunday #OrdainWomen #WhereAreTheWomen Click to Tweet! Including women in decision-making and leadership is a “duty of justice,” say the bishops – so ordain them! #VocationsSunday #OrdainWomen #WhereAreTheWomen Click to Tweet! April 22nd 2018 marks the 55th annual World Day of Prayer for Vocations, a day when the global Church prays for the ministers of the Church and for “young men and women to hear and respond generously to the Lord's call to the priesthood, diaconate, religious life, societies of apostolic life or secular institutes.” While seemingly inclusive language, this prayer neglects to footnote those ministries where women are rejected, silenced and punished for following their call to ordination. We urge the Roman Catholic Church to open the discussion on women’s ordination and reflect on its own participation in the oppression of women by denying women's equality in Christ. To bring our Church closer to the gospel values that Jesus modeled for us, we need all the gifts of the Holy Spirit to be fully integrated into every aspect and ministry of the Church. that our global Church may transform and renew its institution and practices to become a prophetic voice and witness for global gender justice. We pray that our Church will uphold the Gospel message of equality and honor the vocations and ministries of all its members. On this World Day of Prayer for Vocations, WOW takes action! When: April 22nd Find your local Cathedral or parish to check the timing of Sunday mass. It is best to start at least 30 minutes before Mass begins. Where: Your local Cathedral or parish. Visit the site and evaluate where your group might witness. Learn about your local regulations and apply for local permits if necessary. Who: Advocates for women’s full inclusion in ordained ministries around the world will be witnessing in their communities. The goal of this global witness is to amplify the global voice for women’s ordination, exposing the Church’s participation in oppression against women, and support those women who are discerning or have identified a vocation to ordained ministry. Be seen: Visuals are imperative. Bring your banner, logo and signs to make sure your message is clear. Encourage the group to wear purple or purple stoles - the international symbol for women’s ordination. If you are planning a ritual, make sure you have what you need. Some groups bring bread and wine, others use oils to anoint each other on the hands or forehead. Praying for vocations? Ordain Women! Be heard: If you plan to have speakers or a group leader, make sure you arrange for a sound system or bullhorn. This may require special permits. Otherwise, chanting and singing are always good! You may want to print out song lyrics to pass around to your group. Be read: Have the WOW statement or your own leaflets ready to give to passers-by. This should be a short but comprehensive message about who you are, why you’re there, and how to find you. Include social media links. Get the word out about your event to bring supporters and alert the media. Create an invitation or announcement on facebook and email. Hang flyers in your community centers. Make announcements and tell you friends. Share your event on social media using @OrdainWomen and #OrdainWomen. Write a media advisory to local news outlets. Many communities have online calendars where you can easily add your event. Let WOW know of your event and we will include it on our website and in our e-newsletter to supporters. Write a letter to the editor, discussing the purpose of your event, its global support, and the wider effects of inequality in the Catholic Church. After asking permission, take lots of photos of your event! Share them on social media, and follow up with media outlets to let them know of the success of your event. Tag photos using #OrdainWomen. Don’t forget to tweet your photos to @Pontifex and your local bishop.